Custom Master Bathroom in Chantilly Virginia. 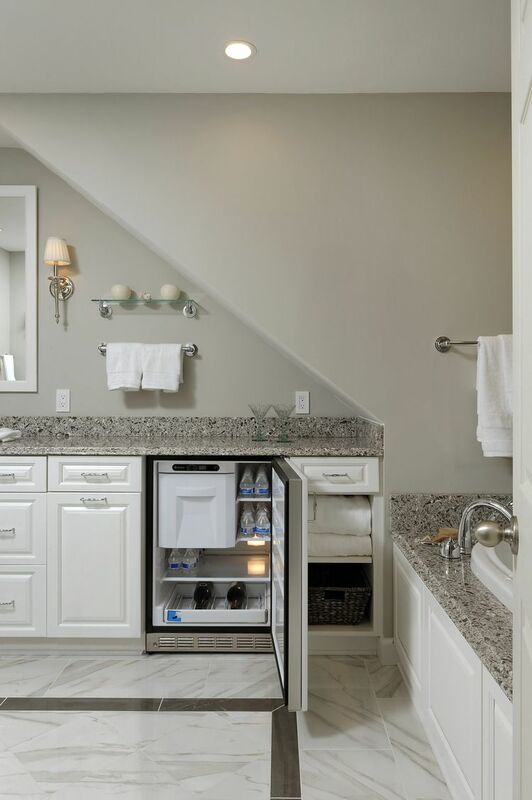 Are you trying to capture additional square footage from existing closets, sitting areas or unused spaces to create a bigger shower, tub, private water closet or vanity area? If so then you're going to need some help. 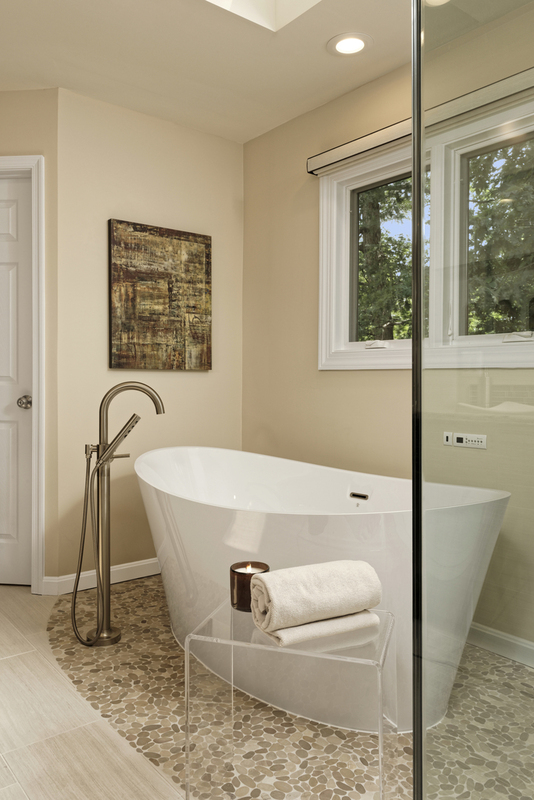 Bathroom remodeling costs can escalate quickly so figuring out the best way to maximize space in your master bath while controlling cost is complicated. We approach bathrooms by working closely with you to determine the options available and provide budgets for each option. Our design work focuses on a few things; starting with floor plan redesign, we look at your existing footprint and steal space from other areas or move fixtures, updating all the finishes, replacing with quality installation and new products. If the footprint is solid then our Pull and Replace Service may be better suited. If you are looking to pull and replace your existing bathroom while leaving the plumbing fixtures in their existing locations making only minor adjustments then our pull and replace services are what you need. We follow the same process as with our larger Design-Build projects but skip the floor plan development. You still get my expert attention on all the finishes and fixtures and the same top quality installation and mastery of finishes. We break our Master & Bath remodel process down into Four Simple to use phases. We start by scheduling your FREE virtual consultation so we can hear your ideas and learn about your project. During this consultation I can guide you with valuable information on what to expect for investment ranges based on the type and size of your project and our services. For Pull and Replace Bathroom Remodels (keeping fixtures in their existing locations) we schedule a FREE virtual labor estimate. With the consultation(s) completed and an investment range determined you are ready to get started on Project Development. Option A. Design + Build. A major Bathroom remodel, relocating plumbing fixtures, adding luxe details and integrated lighting systems first requires getting the floor plan set. 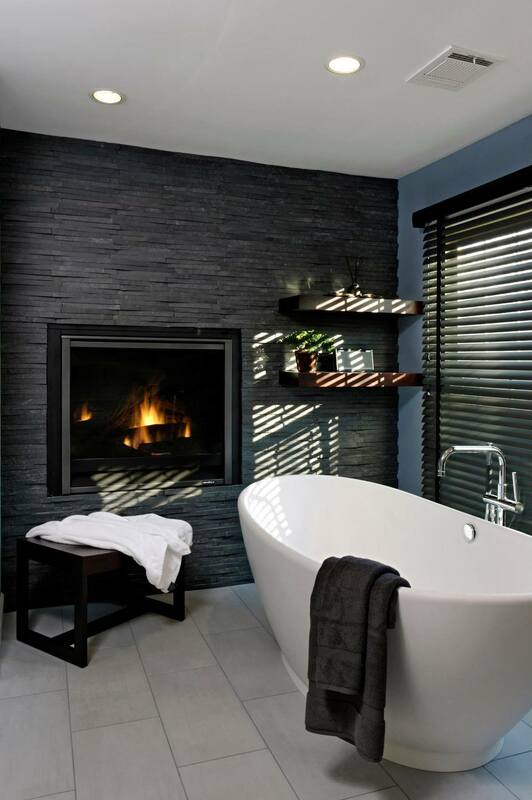 Removing, relocating or adding walls can completely transform your bathroom into a retreat. Preparing the floor plan drawings and realistic renderings provides clarity and insures that your investment is protected. No project is complete without taking the time to consider the fixtures and finishes you will be using. During this phase we combine the floor plan development with selecting flooring, cabinetry, counter tops, plumbing, lighting, glass enclosures, and finish carpentry (trims and moulding) adding a richness of detail and completes the space. With those decisions behind you a full set of plans with specifications and work scope is prepared ready for the build team. Your initial consultation fee ($299.00) is credited towards this Project Development. The investment range at this stage is $2,500. -$3000. Option B: Pull and Replace Bathroom Design. Selection of the tile, cabinets, and counter-top finishes, specifying plumbing, lighting and storage fixtures is the difference between working with any Contractor or choosing to allow us to guide your bathroom remodel. The investment range for our expert hands on assistance varies between $750-$1500. per bathroom based on size and scope. Let the work begin! If you're local and using our build services we begin the construction phase. When you enter into this phase you'll work with us as Lauren and I handle the project management and John works with the build team to create your beautiful new bathroom. Have your own build team? We are happy to consult on your behalf under our project management agreement. Total investment varies dependent on size and scope of bathroom project but typically Design Build starts at $40,000 and up. Pull and Replace Bathrooms at $20,000 and up. Not sure if our process is a good fit for you? Call us and we'd be happy to review your ideas with you.